NASA just released more images of Pluto. And this one is simply staggering. It shows Pluto at sunset (or very close to sunset. Here, the icy world is bathed in the light of a star that is 3.6 billion miles (5.9 billion km) away. The image was released today as part of a data dump received from NASA’s New Horizons probe, which flew by the tiny dwarf back on July 14th, 2015. The pictures that the spacecraft returned so far are simply staggering; however, because the craft is so far away from Earth, it will take more than a year to receive all of the data. But already, we see that Charon is round and pockmarked, and we see that pluto has a heart splashed across its surface. Now, we see the world in a new light (literally). On the right, we see the smooth Sputnik Planum meeting what appear to be massive glaciers. On the left, mountains shoot up as high as 11,000 feet (3,300 m). In the background, the many layers of Pluto’s atmospheric haze drift above the icy dwarf. 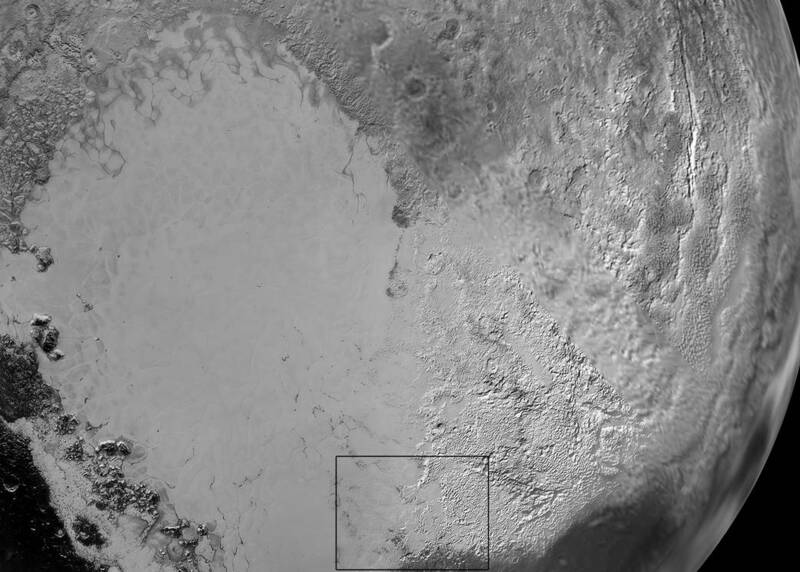 Here, we see an up-close version of Pluto’s heart. It is also known as the Sputnik Planu, which is the informal name of the smooth, light-bulb shaped region on the left of this composite image. According to NASA, the white upland region to the right seems to be coated by nitrogen ice that has been moved from the surface of Sputnik Planum via Pluto’s this atmosphere and deposited in the region. The box that you see towards the bottom of the composite shows the location of the glacier.